The Maidstone man was hit head-on by a course car at Ballacrye after being instructed to return to the Grandstand against the racing direction on May 30. Steve Mercer was left critically injured following a head-on collision with a course vehicle at the Isle of Man TT in 2018. It happened after a qualifying session had been red-flagged following Manxman Dan Kneen’s fatal crash. Mercer, who was riding the Jackson Racing Honda at the time, suffered a catalogue of critical injuries in the incident following the high-speed collision, with the course vehicle reportedly travelling at more than 100mph as it made its way to the scene of Mr Kneen’s accident. The 37-year-old’s injuries included a broken back and a fractured larynx. 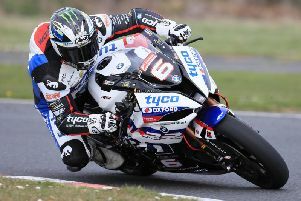 He is still receiving in-patient treatment in a rehabilitation centre for limb and spinal injuries and Mercer faces the possibility of losing a leg, ten months on from the crash. As first reported in the Isle of Man Examiner, Mercer has not been allowed to see the official report into his accident after an independent investigation was carried out by race organisers the Auto Cycle Union (ACU), headed by lawyer Rob Jones – a former chief executive of the UK Motor Sports Association. Maidstone's Steve Mercer pictured on the Jackson Racing Honda at Ballagarey during the ill-fated qualifying session at the Isle of Man TT on May 30, 2018. 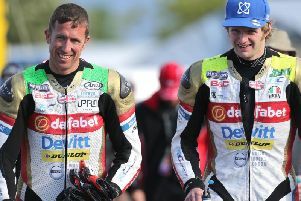 The investigation looked into why a number of competitors had been told to ride the wrong way back along the TT course following Dan Kneen’s crash. It remains unclear who made the call to bring the riders back to the Grandstand in this way. A number of recommendations were made by Mr Jones following the inquiry, including the continuation of a ban on competitors travelling against the racing direction of the TT course. A review of marshal training was also recommended along with additional training for members of race control. Mr Jones’ report also suggested course cars and the motorcycles of travelling marshals should be fitted with tracking devices. The ACU has said the report was a 'privileged document for legal reasons' and that the recommendations made by Mr Jones were being put in place where appropriate.